Cabrinha 1X Trimlite Fireball 2017 44 & 60cm w/spreader bar & pad SAVE $669! Get 2 bars and spreader bar/pad for less than the price of one! Cabrinha 1X Trimlite with Fireball 2017 44cm and 60cm control bars -- one of each size Includes a Fireball Spreader Bar with Integrated Pad. Fireball is an innovative connection method for the next generation of kitesurfing. It’s minimalist design supports a fluid and friction free ball and socket connection. This non binding connection is made to harness the dynamic forces of a kite as it flies through any part of the sky. 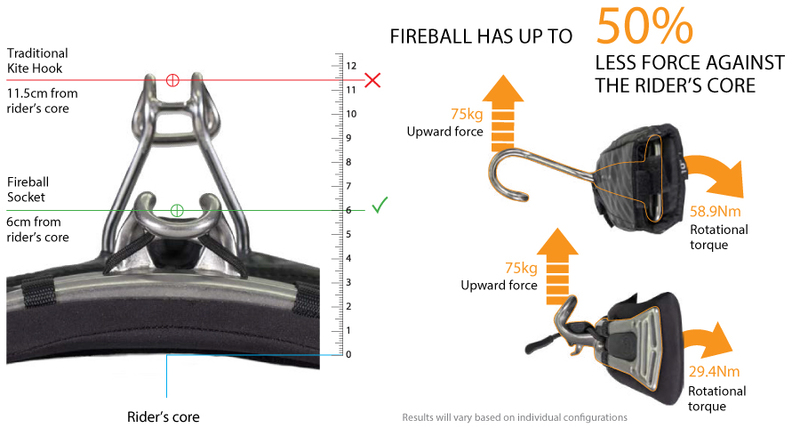 Fireball immediately upgrades any kite and harness to deliver more control, security, and comfort than ever before. Better Control & Performance - Fireball focuses the feel of your kite directly to your core with minimal friction for a seamless connection between kite and rider. More Comfortable - The lower-profile connection point between the harness and spreader bar keeps the spreader bar from rotating into your body when the kite is overhead. Auto Locking Security - No more chickenloop and lock tube. The Fireball is held in place by a locking gate that holds it in the socket and is easy to engage or disengage. Non Binding Freedom - The Fireball's ball and socket connection allows the ultimate freedom in kite position. No resistance or friction where ever the kite is flying. Instantly upgrades any harness - Transform any harness to work with Cabrinha's Fireball system using the specially made spreader bar. Easy Security Activation - Cabrinha's 1X security system is a push-away system that instantly flags out the kite on one of the front lines. 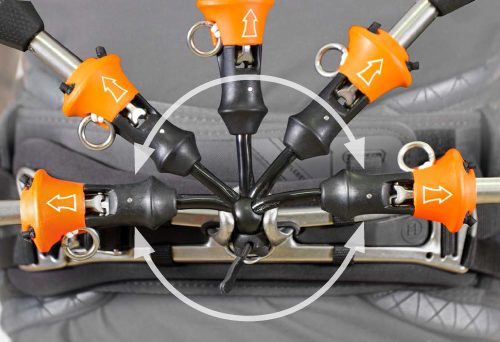 2.9 Second Re-connection - Quick and easy reload of the push-away safety system. No PhD needed; insert the pin through the loop, lift then lower the push-away handle and you're good to go. Integrated Safety - Traditional chickenloop and different shaped spreader bars can't guarantee the security system will work every time all the time. Cabrinha's Fireball system in connection with the specially designed spreader bar ensure a safe connection and flagout. Never Foul Hook - Fireball's ball and socket joint will connect the same way every time. No more chickenloop rotating or coming unhooked if tension on the front lines is lost when launching or in flight. Purpose Built - Fireball is the new frontier of connection between kite and rider, built specifically for kiteboarding rather than repurposing the hook and loop connection from windsurfing. TrimLite Cleat: Our new customized compact stainless steel TrimLite Cleat, allows precise and positive trim adjustment. The light weight design has an elasticized trim line, and internalized mainline and landing lines protected with PU tubing, which gives you the bare essentials with perfect balance and trim to match the changing wind conditions. Internalized Lines: The protective PU tube allows us to run the depower mainline and the 1X landing line through the center of the bar without the risk of abrasion or tangling. Low V: We have lowered the front line connection to the CAS in order to provide a more direct and immediate response from your bar input. 1X Security System: The 1X is not a depower system, it is a full blown shut down system. The 1X relies on only one line to immediately shut down the power of the kite whether it be on land or water in all wind conditions. Depower On Demand: We introduced Depower on Demand in 2005 along with our revolutionary Crossbow kite. Even today, every Cabrinha kite (except the Chaos) incorporates Depower on Demand as the default method to precisely control the power of a kite. Safety Floats: The EVA ends are buoyant enough to float the entire control system with lines attached. The tips have Flex grooves which aid in bending the tips while winding your lines onto the bar or while steering your kite. The 2017 Cabrinha Fireball Spreader Bar System is non binding which allows free, unrestricted movement no matter where the kite is located in the window. At the core of Fireball's design is a rotating ball and socket connection, which seamlessly translates your body movements into an immediate kite reaction with a smooth, frictionless motion. 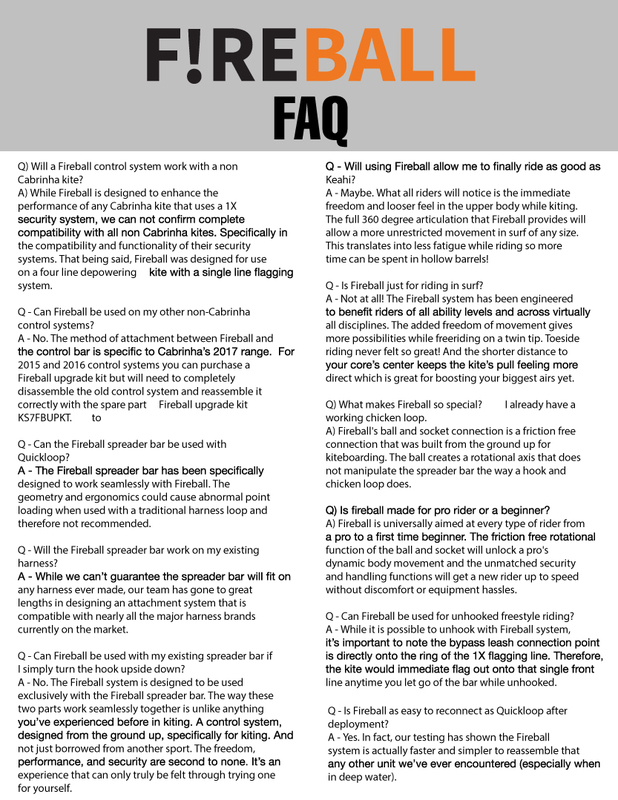 Fireball's ball and socket interface is a semicirculoar fitting that brings the pivot point of the connection extrememly close to your body. Fireball's intelligent low profile design keeps the spreader bar from rotating into your body when the pull of the kite comes from overhead.